Celebrating 25 years in business, Eurocoach NI Ltd has firmly established itself as one of Ulster’s leading private coach and minibus hire companies. Boasting a modern, luxurious and efficient fleet, the family-run operator can take care of all your transport requirements. From humble beginnings in 1991 when they started out with a single bus, the Sinnamon family have overseen the company’s growth to a fleet of 30 vehicles, which vary from minibuses to large luxury coaches. Employing 22 staff, including 14 drivers, in the village of Bush, which is situated just outside Dungannon, Eurocoach NI has become a household name within the industry thanks to its friendly, reliable, comfortable and value-for-money service. Founder and managing director Sam Sinnamon runs the company along with his wife Lorna and son Nigel. Sam is an engineer by trade, while Nigel is an expert in coach painting and bodybuilding. Eurocoach NI has won several awards down the years, with the latest coming on February 6 last when it was honoured with the award for ‘Service to the Community’ by the Federation of Passenger Transport, Northern Ireland (FTP NI) at a gala dinner and awards ceremony in the Galgorm Manor Hotel, Co. Antrim. The gala is the only event of its kind for the passenger transport industry within Northern Ireland. FPT NI is the trade body promoting the use of public transport and coach tourism and represents the province’s leading bus and coach operators, including Eurocoach NI. Sam and Nigel Sinnamon were present to receive their Synectics-sponsored award from Michelle McIlveen MLA, Minister for Regional Development. “It was a nice way to mark our 25th anniversary,” smiles Sam. Before obtaining his bus operator’s licence and setting up Eurocoach, Sam worked as an engineer with Ulsterbus and was sales manager for Wright’s Coach Works in Ballymena for three years. He was also based in Dublin for 11 years where he was Farm Hand’s sales manager for Northern Ireland. Eurocoach NI has certainly come a long way since Sam started with a 49-seater Ford R Series coach a quarter of a century ago. “We started out doing runs for local football teams. 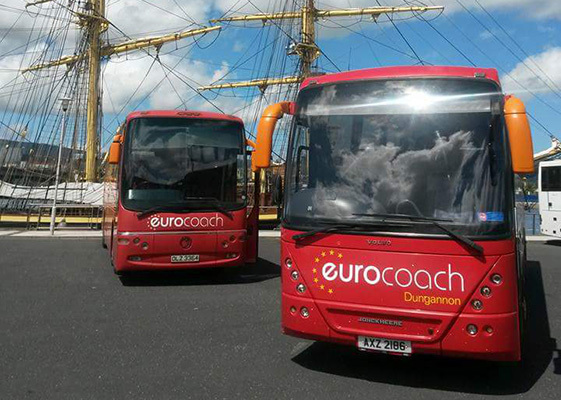 We then bought a second coach – a 19-seater Mercedes – and we’ve been adding to our fleet ever since. We now operate one of the widest range of buses in Northern Ireland, ranging from eight-seater taxi buses with wheelchair accessibility up to 70-seat coaches. In between, we have 16, 33, 51, 53, 55 and 57 seaters. So there’s a huge range there to cater for everyone,” the affable managing director continues. Eurocoach work for customers across Northern Ireland who require group travel and transport for day trips, group outings, church outings, shopping trips, tours in the UK and Ireland, school trips and airport transfers. The fleet is one of the most modern and safest operating in the market. The executive coaches offer air conditioning, audio / video facilities, WC facilities and comfortable reclining seats with ample leg room. Eurocoach’s dedicated team of professionals will make your journey as comfortable and relaxing as possible. Each of the drivers are uniformly branded with the company’s distinctive logo. The buses, which are DOE approved, fully insured and fitted with seat belts as standard, are a mixture of Volvo and Mercedes. And there’s a very good reason for this, apart from the fact that they are two of the leading brands on the market. “The main reason why we buy Volvo and Mercedes is because they are the nearest dealerships to us,” Sam explains. “Dennison Commercials are main Volvo dealers and they are only two miles away from us. As well as providing an excellent service, they are very good when it comes to offering technical advice. Also, if you order a part from them, you will have the next day. Eurocoach’s Dungannon location means it’s also beside the M1 Motorway, and just a short drive from the Republic. The company’s staff consists of drivers, bus escorts, mechanics and administration. All servicing, maintenance and repairs are carried out in a state-of-the-art workshop. All driver training also takes place in-house and complies with FPT guidelines. To get a quote on the bus that suits your needs or for any other information, please contact Eurocoach NI. Their friendly staff will be delighted to help.